Unlike regular landlines, cordless phones provide movement flexibility for users and are a popular choice for homes and offices. With added features and multiple handsets, they provide communication for even the biggest office, and whether you need a 12 phone set or a single cordless unit for home, the perfect phone is waiting for you. To help you choose the right device, this cordless phone shopping guide gives you everything you need to know to compare cordless phones so that you can easily pick the right one for you. 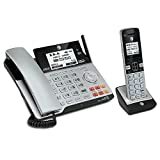 Analog Cordless Phones: These older phone types are the most cost effective cordless phones, and because they are fully serviceable, they are perfect for small homes, office, or study use. Digital Cordless Phones: Digital cordless phones offer excellent reception. Because digital signals can not be picked up easily by scanners (or devices like your neighbors baby monitor), they are a more secure phone for businesses. 5.8GHz Spectrum Cordless Phones: Their 5.8 GHz frequency provide users with the good reception, range, and security, and their channel-scanning abilities provide the best reception. 2.4 GHz: Spectrum Cordless Phones: Offering the best spectrum cordless technology, these phones enjoy practically no interference from other devices. They are able to separate signals into two different frequencies offering better call quality. 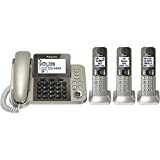 900 MHz Spectrum Cordless Phones: These phones send multiple frequencies instead of sticking to just one, and scan for the clearest channel on a continuous basis. Their range is ideal for bigger offices needing the best call clarity over a wider range. Digital-Enhanced Cordless Phones: Also known as DECT (digital-enhanced cordless telecommunications), these phones offer the newest technologies. Allowing more than one handset to be connected through wireless technology to the home base, this multi handset device is ideal for bigger business. Video Cordless Phones: These cordless phones provide video calling and team up with your home security system to be used as a video intercom system. Ideal for home and office use for added security. Battery Life: The battery life of a phone is a big concern for reviewers. Cordless phones offer office and home flexibility. A longer battery life is important to maintain this, especially in bigger homes or offices. If this is a concern of yours, compare the battery life expectancy of best rated cordless phones to find one that suits your needs and space requirements. Call Quality & Range: Handsets offering clearer call quality over bigger areas are the most valued phones by reviewers. When it comes to small businesses especially, cordless phones need to be able to reach different areas of the business with ease and without losing quality. Phones capable of this are rated much higher. When choosing your phone, consider the size of the area you will be using your phone and match it to the phone’s range specifications. Functions: The most important phone functions are the intercom and voice mail functions, and cordless phones that have well operating well versions of these are reviewed higher by their owners. Phones with good quality intercoms enable owners to communicate well from back offices, to store fronts, or communicate from an outside room to inside the home. Being able to listen to your voicemails from the handset is a convenient feature and is valued by consumers. Features: The two features that result in the most positive reviews are bluetooth and link-to-cell features. Cordless phone owners find phones that offer bluetooth connectivity very convenient as they are able to sync their mobile contacts with their phone contacts with the push of a button. The link-to-cell feature allow users to call from their landline or mobile line numbers from their cordless handset. Range should be your first consideration when buying your cordless phone. Phones with longer ranges should allow you to use the phone anywhere in and around your phone base without losing signal. Check manufacturer specs of each of the top brands to see what range they are offering vs. the size of the space you will be using the phone in. When deciding on the frequency of your phone, here is a small ‘cheat sheet’ for you: 900 MHz phones offer great value for money, good call quality and are a popular choice for home use. 2.4 GHz offer a better range and more security, ideal for the home office. A 5.8 GHz frequency phone offer less user traffic, are not affected by wireless networks, and therefore offer users much less interference. Each frequency offered by cordless phones can be further divided into channels which are scanned by your phone to find the channel with the least amount of traffic. The more channels your new cordless phone uses, the better your call quality will be. Cordless phones that include a corded landline at the base of the phone unit will ensure that even if you are without power for any reason, you will still be able to make calls in an emergency. Essentially this also offers better value as it is giving you two phones for the price of one! If you are choosing a cordless phone without a corded phone included in the base, you may find a base keypad helpful. Normally offering larger buttons than the cordless handset, it makes dialing and menu changes easy. Glow in the dark keypads are even more convenient as they enable you to adjust settings, search menus, dial numbers, and answer on the base keypad in low light situations. Some cordless phone bases offer USB ports which enable you to use your phone base as a charging station for smartphones, tablets and other devices. Other features of your base station to look out for are an LCD display, speakerphone, call waiting, caller ID functions, multiple phone lines, digital phone book, speed dial, answering machine, clock, or even a radio. All are designed to make your phone system (and office) more efficient. Cordless phones batteries have a lifespan of about two years. To prevent replacement hassle later on, look for a phone that uses standard rechargeable batteries that are more accessible and easier to find, such as Ni-MH batteries which also have a longer lifespan than other batteries. Another good battery choice is Lithium as they are lightweight and easily available. Cordless phone packages that include more than one handset offer greater value for money than adding additional handsets later on. If you do decide to add handsets at a later stage as your business or needs grow, look for a cordless phone now that offers expandability. This means you will be able to add on handsets at a later stage. Multi-handset options not only allow you to place phones around the home for easy access, but they can be used as an intercom or push-to-talk systems which are very handy for inter-office/home/business communication. The quality of your answering machine message recording is an important consideration. A bad quality recording could mean you are unable to get the details (or numbers) from a missed call. It is worth comparing reviews of phones to find models that consumers are most happy with. A link-to-cell feature of a cordless phone enables users to link and sync mobile and cordless phone units via Bluetooth. This is particularly handy when transferring over contacts and being able to use your cell line as a second line. Bluetooth will also enable you to connect other devices, like bluetooth headsets, to your phone. Some phones accommodating more than one line offer different ring tones per line, which will allow you to easily determine which number is ringing and quickly decide if you would like to answer the call or send it to voicemail. When choosing the internal memory size of a cordless phone, think about how many contacts you have or anticipate to have. Any phone with less than a 50 number phone book will not prove efficient. Other features to consider that will add more function to your phone are caller ID, call screening, backlit keypads, conferencing functions, an answering machine, speaker phone function, and a voice-mail indicator. Additionally, look for a cordless phone that includes a port to plug in a headset for hands-free talking if you would find this feature useful. An auto-talk function on a cordless phone means that the device will automatically answer the call as soon as you have picked up the device from the base, and is ideal for a busier office when quick answering is needed. Household devices such as Wi-Fi networks, game systems and even microwaves can disrupt your call quality on a 2.4 GHZ frequency, so it is important to consider this when deciding where you will place your home cordless phone. For the best call quality results and better range, choose a spread spectrum phone of 900 MHz. Analog phones have 46/49 MHz frequencies and are ideal for home or study use as their older technologies make them easy to use and very affordable. DECT phones have the least amount of static overall and are the newest cordless technology. These phones suffer from very little interference and are not disrupted by household devices. If you plan on using your cordless phone as an intercom, consider a phone that offers video calling functions. With features such as night vision, you will be able to always see who is at your gate before opening it no matter the time of day.